Following many years of successfully blogging as MotorPunk, Darryl Sleath and Rich Duisberg are turning their automotive adventures into a printed magazine. Above all, there'll be lots of love for the best of British that you won’t find elsewhere. 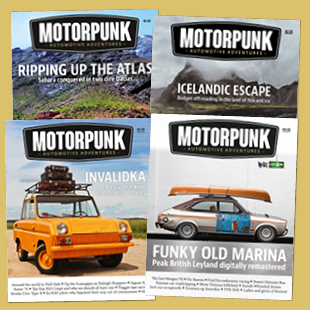 MotorPunk won’t be available in high street shops, so to get your hands on a copy you’ll need to order a copy here, or better still subscribe and we’ll pay the postage (UK)! It’ll be quarterly and the first issue will be published in August.